Today was the final day of The Great Rattler Run. 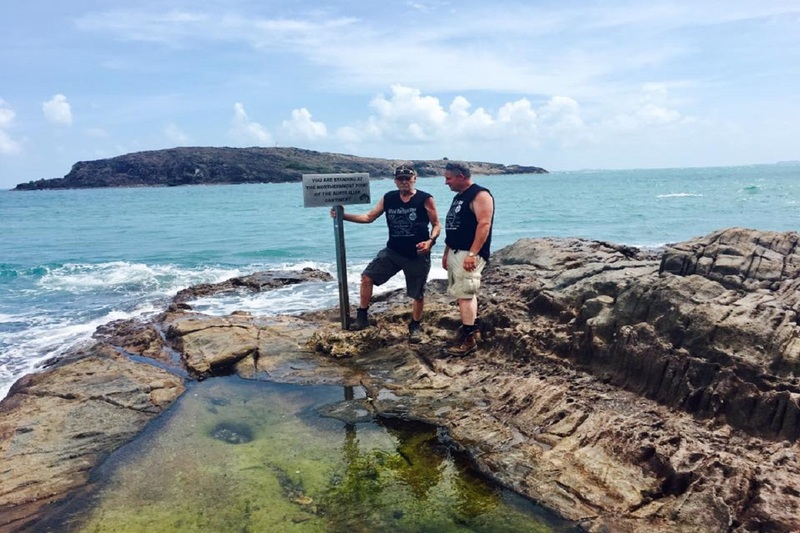 Our adventure was drawing to it’s conclusion and we would drive The Rattler to the tip of Cape York! Having come this far, how hard could it be, right???? Guess again! We started the journey early, getting up at 5 am in anticipation of a 7 am start. We decided to take a track out to the main road heading up to The Tip! Did we somehow forget that The Vito wasn’t a 4WD? We didn’t forget for long! As the fairly unused private track twisted and turned its way through the landscape, it felt like we were taking the goat track down to the beach from Whoop Whoop! As The OTT Dream Team motored on, we all started to show a little concern about whether The Vito would make it. After all, I didn’t send it around The OTT on the Development Road for nothing! Before long, the van was bogged in the sandy track, and Kevin and Mark were mucking in digging her free! They attached the tow strap to The Landcruiser and towed it out. We limped the next 10 or so kms out to the unsealed road, turned left and headed for the top! As we weaved along the final few kms, the Aus bush gave way to dense tropical foliage that engulfed the road, the tell tale sign that we were approaching our destination. Our tropical tunnel led us straight to the lure that had drawn us closer and closer, all the way from Cockle Creek. As we pulled into the carpark where The Rattler would have to wait while we walked the final leg overland, I was a little sad that we couldn’t take her the last few hundred metres. She had seen mountains, plains, snow, rain, wind and sunshine, an ocean crossing, thousands of kms of bitumen, hundreds of kms of unsealed tracks and roads, two river ferry crossings and of course Gunshot Creek and all it’s mates. But sadly, she would be put in the corner while we took the final trek to the infamous sign at the end of the rocky outcrop that we now know is the top of the Australian Continent! After a final team photograph on the beach at the carpark, I took my first walk for about 3 weeks! It’s not that far to the sign, maybe 15 minutes or so, but the flood of emotion slowed me down a little. The end was near, but I couldn’t help but feel a little deflated that my girls weren’t well enough to make the trip with me. My daughter Lou would so dearly love to be here, and eagerly awaits my regular checkins by phone every day. Both she and my wife Nola spent many hours helping out with all the prep for this run. I couldn’t have done it without you girls, and even though you couldn’t be here with me, both of you and others close to us who have passed, were here in my thoughts. What more can I say really. Yesterday, Lakeland to Ayr. Today we are heading for home! Here’s a video of Palm Creek. Imagine what this would be like with the water flowing!